The very last space shuttle flight before NASA retires the 30-year program is targeted to launch on July 8, space agency officials announced today. The shuttle Atlantis is slated to carry four veteran astronauts to the International Space Station to deliver supplies and spare parts for the orbiting outpost. NASA is targeting to launch Atlantis from the Kennedy Space Center in Florida on July 8 at around 11:40 a.m. EDT (1540 GMT). STS-135 will be Atlantis' 33rd and final mission before it is retired, along with the rest of the agency's orbiter fleet. The historic flight will be the 135th and final mission of NASA's space shuttle program. In the weeks leading up to the launch, NASA will conduct several non-standard activities, including tests and close inspections of Atlantis' external fuel tank. Mission managers want to X-ray aluminum support beams, known as stringers, located near the mid-section of the fuel tank. An X-ray inspection of the similar metal ribs on Atlantis' fuel tank will provide extra confidence that there are no cracks, NASA officials said. Some of the ribs were already modified with extra material to add strength and do not require inspection, they added. Atlantis' STS-135 mission will mark the 135th and final flight for NASA's space shuttle program after 30 years of spaceflight. The space shuttles are retiring in order to make way for a new space exploration program aimed at sending astronauts on deep space missions to visit an asteroid by 2025, and then aim for Mars. 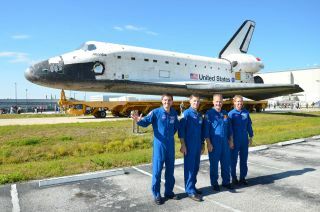 After Atlantis' final flight, the shuttle will be sent to the Kennedy Space Center Visitor's Complex for public display. NASA's two other space flown shuttles, Endeavour and Discovery, will also be sent to museums. The shuttle Endeavour is currently flying its final mission, called STS-134, and is docked at the International Space Station. Endeavour and its crew launched Monday (May 16) to deliver a major astrophysics experiment and perform maintenance on the space station during four spacewalks. Endeavour is due to return to Earth on June 1.